I am a sub user of a paid account and it doesn't seem that my account is on the paid plan. Can you confirm that my forms are on the paid account? The paid subscription plan for each account cannot be shared to sub-account users. 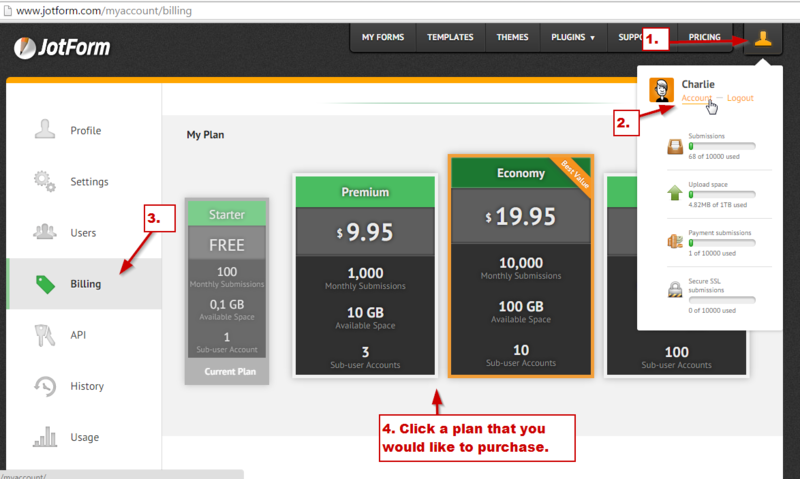 In short, paid subscription plan will only be applicable to one account, sub-users can purchase their own higher subscription plan by navigating to Account Settings->Billing->Upgrade to a higher plan. You can just think that sub-users are independent account that has forms shared by another user. To learn more about sharing forms you can check it here: http://www.jotform.com/help/232-How-to-Share-Forms-with-a-Sub-Account-User. So let me understand this if I am paying $19.95 per month and it says that there are 10 sub-user accounts these users do not get the same features as the primary account? Is this correct? If I need a form to have the features for the paid account level do they have to be placed under the primary users account? The sub-user accounts in each account subscription plan means the number of allowed sub-users you can connect or create. But it will not share the subscription plan that the main account has, however, the forms shared to the sub-user account will follow the submission limits of the main account. Main account is "Charlie" with Economy plan, I shared form1 to sub-user1, I will let him edit and see the submissions of it. BUT the form's submission limits will depend on account "Charlie" not sub-user1.